Lot Detail - Eric Lindros' 1997-98 Philadelphia Flyers Game-Worn Captain's Jersey with His Signed LOA - Customized Sleeves! Eric Lindros' 1997-98 Philadelphia Flyers Game-Worn Captain's Jersey with His Signed LOA - Customized Sleeves! Another banner year for The Big E in The City of Brotherly Love, the 1997-98 campaign would witness Lindros secure better than a-point-a-game average, along with making his second of five consecutive NHL All-Star Game appearances. We have a signed Philadelphia Flyers captain’s jersey from that very season worn by Lindros. A Nike size “58” label with handwritten “88” sits affixed to the collar near a Center Ice tag, with embroidered NHL and Nike crests over the reverse bottom hem. 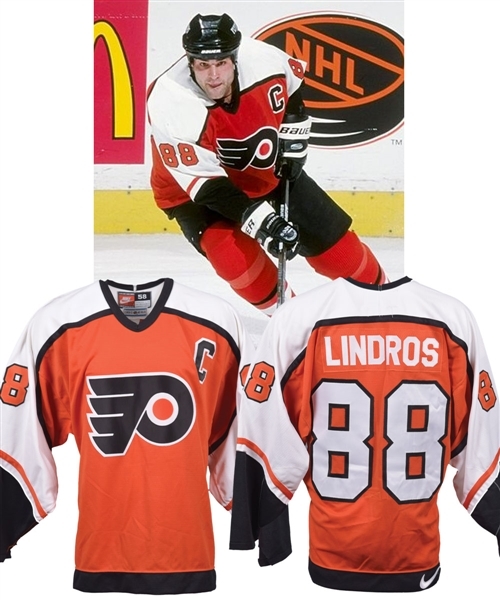 Styled with the forever popular winged-P Flyers team crest, the mesh-style V-neck has been accented with oversized tackle twill sleeve and verso numbers, with “Lindros” across the nameplate in single white twill. The garment also sports customized vented sleeve cuffs, with both Eric and the Flyers’ team trainer signing the reverse of the team crest in black marker, with “97-98” added. A signed LOA from Eric Lindros will accompany. Dark marks are visible over the front beneath the team crest, with additional examples present over the right elbow and shoulder. There are also two minor fabric pulls near the team crest.